Thank you Nick for setting up the platform on the ice at Browns Lake and getting us the five meters of mud we need for lab on Wednesday. This is the first teaching of this course called Paleoclimate. 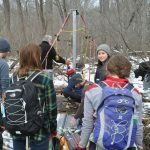 We have a lot to do this semester – we will core a lake, core trees and visit ice cores. The course was formerly Climate Change – you can glance at the previous posts at this site and see the work other past classes. With the issues surrounding Climate Change at the forefront these days, the course takes on a new urgency. I look forward to learning about the past operation of Earth’s climate by examining the paleoclimate records of others and generating our own. We then will examine how these findings are relevant to anticipating our present and future greenhouse world. Climate Change 2017 is pleased to have been asked to date the Tracy House, Apple Creek Ohio. The log house/cabin is now stored in the soon to be Apple Creek Community Center and Library. The house will be reassembled this coming summer. The date is unambiguous and most of the timber was cut after the growing season of 1826 and it is likely that the house was originally constructed in 1827, one of the first to be built in the East Union Township. A copy of our report can be found here. Nick gives the crew the rundown. Graph showing an 100 year overlap between the North East Ohio (NEO) ring-width chronology and the ring-width chronology from the Tracy House. For the full 230 year period of overlap the correlation is 0.75 – pretty impressive, it shows the power of tree-ring dating and the sensitivity of white oak to climate in Ohio. To learn more about the utility of this data view this. Dean extracts a core from a beam of the Tracy House under the watchful eye of Annette – the TA, as Conner looks on. Extracting a core being careful to preserve the outer ring of the core (don’t bend the extractor John). 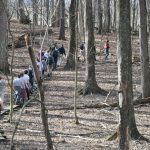 Special thanks to the Apple Creek Historical Society for working with us on this project. Below is the group resting after work on a 70 degree F day in February at Browns Lake Bog where they cored some of the remnant old growth oak stands of Northeast Ohio. Two class projects kick off the Climate Change course. The first deals with tree-ring dating (dendrochronology, blog post coming soon) of historical structures and then analyzing the tree-rings for their climate significance. The second is is shown below and it concerned with analyzing sediment cores that document climate variability since the last Ice Age. 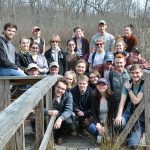 Below are some photos of the bog coring – great thanks to Dr. Tom Lowell and his Glacial Geology class from the University of Cincinnati – the folks who did most of the work. Setting up the coring rig at Browns Lake – early in the day snow covered the ground by 4 pm it was gone. The core boss (Dr. Tom Lowell) oversees the extraction of another meter of mud from the bog. The probing team sends down 7 rods through the mud until refusal. Mapping the mud thickness gives an idea of the geometry of the bog and allows for the construction of an isopach map. Extracting peat – the upper 5 meters or so are peat. Setting up the production line. 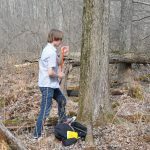 Coring a tree to determine the recruitment time – the hypothesis is that these trees moved into the bog recently (past 200 years) – the first trees here since the Ice Age. This nutrient limited bog was fertilized by wind blown dust during European Settlement allowing these vascular plants to obtain a foothold in the previously sphagnum moss dominated bog. 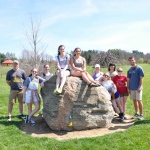 Hey there is a Wooster student – good job Ben. Nick samples the bog water for its isotopic composition. 2016 was one of the warmest years since we have been keeping track of global temperatures over the last 150 years. 2017 will be warm as well; in April we will see carbon dioxide levels break an all-time (since humans walked the Earth) high – likely over 410 ppm. This course is an exploration of climate basics, paleoclimate and contemporary climate change. Understanding how and why climate changes is important for interpreting the past geologic record and evaluating contemporary climate change. After an overview of Earth’s ocean-atmosphere system and energy balance, we will explore Quaternary (last 2 million years) dating methods and techniques of reconstructing past climates through field and lab projects. Students will work with paleoclimate data sets from ocean cores, ice cores, tree-rings, lake cores and corals. 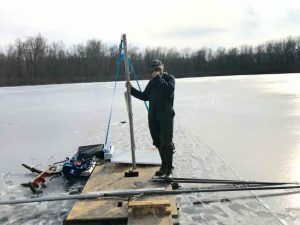 Labs will include computer modeling, analysis of time series and field and lab projects extracting lake sediment cores and collecting and processing dendrochronological data. Preparation questions: For each class you will be required to answer preparation questions – they will be linked to the weekly syllabus. They should be answered before the following class as they are designed to guide the discussion for the next class. Text books: We will be having readings from a variety of texts, n one text is required however a good one is the The Thinking Person’s Guide to Climate Change by Robert Henson (2015). Some readings throughout the class will be from THE GLACIAL WORLD ACCORDING TO WALLY and THE ROLE OF THE OCEAN IN CLIMATE YESTERDAY, TODAY , AND TOMORROW (available online and at the password protected readings tab)- written by Wally Broecker, a renowned climate scientist from Lamont-Doherty Earth Observatory. Goals: Climate Change is a Q (quantitative) course thus students will need to generate, manipulate and interpret quantitative data. In addition we will use geologic concepts to solve problems and understand and apply scientific methodology. This course is also field and lab intensive and so students will demonstrate their ability to apply Field/Laboratory skills. As we will be performing original studies of lake and tree-ring proxies in the Wooster region students will be need to demonstrate independence of thought and expression (and also behave properly when we are out on trips). The work in this class will demonstrate integrative thinking by problem solving through multiple approaches. Finally through writing reports and giving class presentations the students will develop their communication skills. – the fundamentals of the Earth’s climate and how biogeochemical cycles and ocean-atmosphere systems operate and interact. – how the observational and proxy records of climate change are generated and analyzed. – the role and significance of natural and anthropogenic (human-caused) forcings on climate and strategies that can mitigate the impact of climate change. 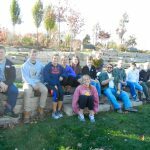 Below are posts from Climate Change 2016 as well as previous Climate Change classes.